The Blessing Way, Edited Manuscript. 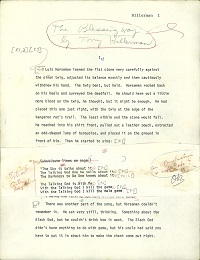 This final version of the manuscript includes written notes and comments from the editor as well as Hillerman's responses. Written well before the popularization of email, it is apparent that this manuscript was exchanged several times between the author and the editor via regular mail, as there are initial editorial comments, then responses from the editor, and then further responses from the author all throughout the text.